25/03/2019 - Remediation works complete, macrophte planting is continuing. 15/2/2019 - Remediation work to repair damage caused by summer storms in on track to be completed mid-March, weather permitting. 11/2/2019 – Weeds are being managed on site. However, many - particularly those in among recent plantings – will be temporarily left in place to help with stabilisation and consolidation. 6/2/2019 – Remediation work to repair damage caused by frequent summer storms is under way and will continue for a few weeks, weather permitting. 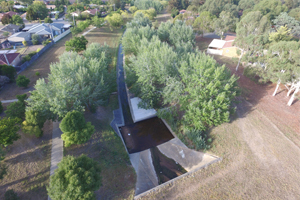 This project is one of seven ACT Healthy Waterways sites across the ACT where works are taking place in an active water course and, as such, it is very susceptible to damage and delays during construction. Soil, plants and infrastructure can be washed away before they are established. While the weather is fine, crews are working to repair damage and establish infrastructure that will slow the water down and protect plants and soil before the next storm event. 29/01/2019 – Damage caused by summer storms is being rectified and construction has recommenced. 24/10/2018 - Damage sustained during the recent storm is currently being assessed. 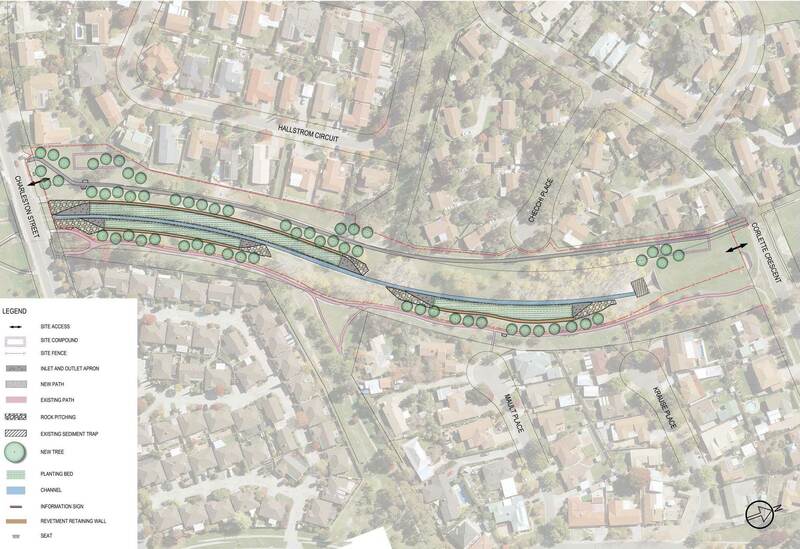 Two sections of the existing concrete channel between Corlette Crescent and Charleston Street that carries stormwater from the surrounding suburbs into Isabella Pond will be reshaped and revegetated. This will slow down the water in periods of low flow allowing the vegetation to process pollutants and slow the movement of sediment into Isabella Pond. This creek is a popular walking spot for local residents and the restoration of the creek will allow them to enjoy the space even more. These works also complement the two new wetlands being constructed in Isabella Pond. + Construction may be delayed by a number of factors, including bad weather. ^ The vegetation establishment period may change depending on ground and weather conditions. During the establishment period, flows into and through the asset will be managed to suit the conditions and to protect and nurture the plants. * Some areas of the site may remain closed to allow for plants to establish. During the final design phase, some changes were made to the original concept designs to accommodate community feedback, make best use of the existing terrain, reduce project costs and maximise water quality outcomes. The project site was relocated to avoid disturbing a stand of native trees. The concrete invert will be retained and the vegetated swales widened to carry high flows and protect against erosion. Find out about other ACT Healthy Waterways projects. Any detours for walkers and cyclists will be in place and will be clearly signposted.